A variant of Ufone Solid Offer is back. Now every Ufone to Ufone call will cost you Rs. 2.99 plus tax and there is no limit on Duration of call. This call call rate is for round the clock and with no daily charges at all. So idea is that any Ufone to Ufone call, of one second, 10 minutes or 50 minutes duration – it is going to cost you Rs. 3.57 (including texes) per call. This is limited time offer (just like Ufone Solid Offer) and comes with a subscription charges of Rs. 25 plus tax. subscribe to this offer make your Super Call today by just sending 33 in an SMS to 444. This offer is valid for Ufone to Ufone Calls only. This offer is available on Uwon, Tension Free, Public Demand & Josh Packages. This offer is not available on Bundle offers. One time charges of Rs. 25 + Tax will be applicable on availing this offer. Maximum duration of a call will be 59:59 minutes. This offer will directly hit Warid Glow as they are also offering this offer but only from 11:00pm till 08:00am although 24hrs on weekends. That is what I have also mentioned in Ufone Solid offer last news. Main Ufone use kar raha hun or Solid offer b use karta raha hun per or daily lond duration calls karta tha lakin aj tak meri call to cut nahi hoyi hay. As Usual, UFONE IS THE BEST! Wot a great offer. Ufone really cares about their customers. Thanks alot Ufone. you phone TUMHI to ho!!!!!!!!!!!!!!!!!!!!!!!!! 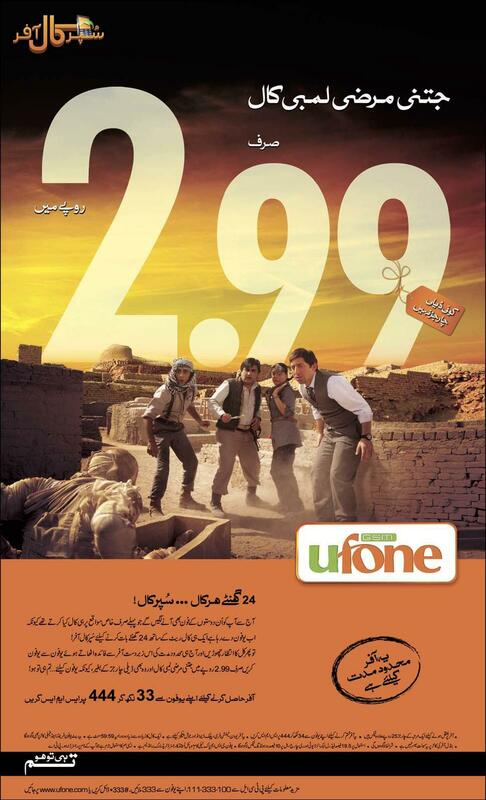 What a offer by ufone …. mobilink walo sharam karo!!! can any body tell me wat would be the charges for offnet calls if smone subscribes to this package!!! Very good offer by Ufone. Really Ufnoe is No. 1. Pls. keep this offer up Ufone for a long time. yeah “Plus Tax” wala chakar khatam hona chaiye. aik tu taleem ki bouth kami hai aur, dosar har banda itna kabil nahi hota kay har charges kay plus tax behi nakal sakay. jo charges ads main batay jata hain, haqeeqat main us main tax shamil nahi hota, isi waja say aksar log khatay hain, kay falan compnay walon nay passy zida katay hain. 100 rupay ka card main say 60 rupay hi customer kay kam kay hotay hain. hoskata hain, main galatfehmi ka shikar houn, agr houn tu meri rehnumi farma dain. Jo bhe tariff ho us ko 1.195 se multiply kardein, aap ko charges including tax pata chal jaye gein..
Limited Time offers is just for getting customers or attractions of other telecom operators. Ufone is service is very pathetic. Lots of disconnection and signal problems. Nice offer not as good as solid offer but still i will go for it. Ufone Is The Best Mobile Network Pakistan. ufon walo sharam karo 100 rupee ki balance mein si ghariboon ki sirf 60 rupees kam ki hotay hein baqi tum log tax mein kha jatay ho. kitna zardari ka is mein tax shamil hota hay. Is ni to ghariboon ki moon si roti cheen lei hay. o bhai sahab, tum kuch shrm kro, tumaam mobile fone networks companies government taxes lagu krti hain, soch smjh kr likhha kro. Kindly note that the word package means permanent thing and offer means limited time thing. Ufone clearly said in its ad that its a limited time offer. No company can offer such a low price on permanent basis. If such rates are offered on permanent basis then they are highly price. Mobilink offers all calls at Rs 3.99/call and charges Rs 5.99/day. If you want such thing on permanent basis, Ufone has super ghanta package, which offers calls at Rs 3.5/call and charges Rs 5.99/day. And it is permanent. Ufone ki tareef mein qaseede prrhne wale is baat ka jwab de skte hain kya ke is company ne balance check charges impose kyun kiye hain dusri ghatya companies k peeche chal k aur msg delivery reports khtm kr k dobara charges kyun laga kr laye? Awam ki bhalai k liye? Tumhi to ho k kuch lagte! Ufone super call is not like solid offer. yar inhein pckges ki wja se to ufone alaa hai r isey chorne ko dil he nai krta……. In this case you cant make short calls for every call you will charge Rs 3.57/call. Once again Thanks to Ufone. Ufone comes with an interactive and unbelieveable Offer named Super Call. Ufone is Great….Thats why I cant leave Ufone as it always giving a great favour to its customers. Keep it Up UFONE…….Tum Hi To Ho…..
agar sms bundle pakage hoga to nhi hoga???? DATS GOOD, BUT TIME LIMIT IS AWAY CZ IT IS OFFER, BUT USERS DON’T THINK SO. JUST DIAL AND ENJOY. IT IS VERY LOW PRICE OFFER FOR LONG TIME CALLS. ye mobile companyun ne night packages nikal rakhen han ye kis lye han kis kam ke han kia ye kisi shopkeeper ya kisi aam aadmi k kam k han in night packages ko khatam kar k kisi aam admi k lye ek acha package nikalain ye mobile companiyan but ye uth package bhee acha hay is me call 4 rs per hour parti hay 24 hour u2u ye night package se lakh darjay acha package hay is jase or package nikalne chahyen in night packages ko khatam kar k.
ufone ki kia bat hai………………..
islye t kehte hay k sirf tum hi to hu……..